When the wind is still and the tide is high, wait at the sea's edge and listen for the song of the mermaids. 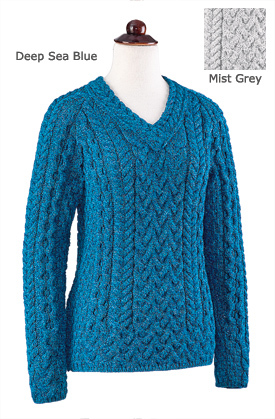 The color of this sweater echoes the deep blue of the winter sea; trim fit recalls the elegance of the mermaid. 100% merino wool, hand wash. Sizes XS-XXL. Made in Ireland. Also in Mist Grey.